The lobby was filled with parents and teachers mingling, nibbling and vying for a chance to speak with our new Head of School. Flashes burst, people laughed, parents pushed. And after a talk by Dan Bronish on the academic vision for the school, it was with easy elegance and a determined gait that she graciously took the stage last Tuesday night, thanking the roughly hundred and fifty assembled parents and faculty for such a warm greeting, affirming how hard she had fallen for this community the first time she walked onto campus as a prospective leader. While it won’t be until May 14th that Mariandl Hufford will address the whole community with her educational philosophy and vision, she sat down with The Spartacus earlier in the day to share what matters most to her. Stories, Mrs. Hufford told us, are the best and most powerful way to shorten the distance between two people. 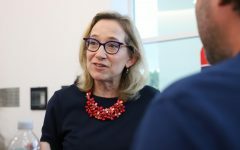 So it comes as no surprise that her first order of business as the 7th Head of School will be to learn the myriad stories here at Country Day, from students, parents and faculty, as a way to craft what her first year will look like. Second will be building on the strengths of the school. And third, she wants to study and master Spanish. A dual citizen of both the United States and Netherlands, her passion and candor come through vividly as she sprinkles into her conversations words like “thrilled,” “love,” “awesome,” and “kindness” or talks about her favorite song or who she’d chisel into Mount Rushmore or her fondness for Bruce Springsteen. Yet it’s clear that as a leader she has vision, encourages debate and wants those she works with to feel comfortable taking on tough issues. Mrs. Hufford is a lover of languages, and while Dutch is her mother-tongue, it is just one of many she knows well. Her career has incorporated teaching English and Latin in the classroom, counseling students, scholarly research on developing leaders and female empowerment, along with numerous positions in school administration, including her current one as Assistant Head of School at the all-girls Agnes Irwin Academy and Director of the Center for the Advancement of Girls, outside Philadelphia. Encouraging leadership, especially among those who have historically not had the opportunity, has been a focal point of her work and is essential to her. 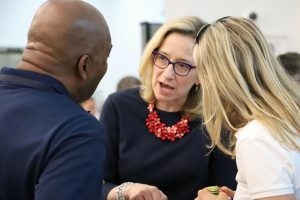 Candid conversations, believing in people’s best intentions, and developing and maintaining “good rules of engagement” are the foundations of her leadership philosophy. She greatly admires humility, loves to give credit “when things go really well” and says she seeks lots of input for her decision-making, conceding, of course, that ultimately, she is the decision-maker. While she does plan on “building strong teams” when she comes to MCDS, she is not planning on bringing in any new personnel with her to the school. When asked about how she would handle issues dealing with complaints of lack of diversity in the school, she refers to similar issues in other independent schools, explaining that “a lot of schools are grappling with sort of a polarization of the culture and the climate in their schools,” but at the end of the day she just wants, “every student in a school that [she] work[s] in to see themselves reflected to feel included and to feel understood… That’s hard to accomplish, because the more people you have in a community it gets exponentially harder to accomplish that.” Yet, she thinks this can be achieved by being “clear about what we collectively value” or in other words, being accountable for what we stand for, believe in and will and will not tolerate. President Gary Butts looks forward “to partnering with [her] to provide the Miami Country Day community with the finest independent school experience possible,” and hopes everyone will join him in welcoming her to our family. 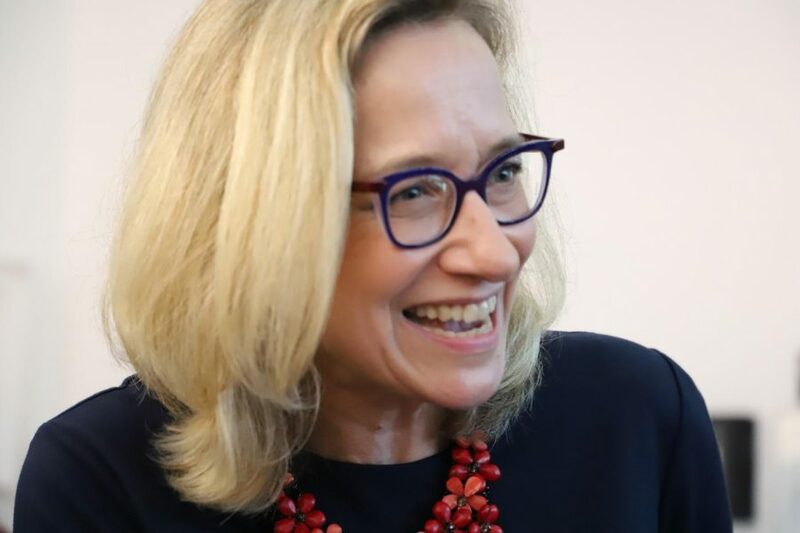 Her door will be open from July 1, 2019 onward as Mariandl Hufford steps into the role of 7th Head of School and the first woman in this position.